Konnopke’s Imbiss is an institution in East Berlin. The small food stand located under the U-Bahn track in Prenzlauer Berg has been serving currywurst at this location since 1931. In the 1930s, the Konnopke family started selling sausages and frankfurter at this location. Over the years, they converted their business from a simple table to a wooden booth and finally into a permanent stand with electricity, water, and propane gas. 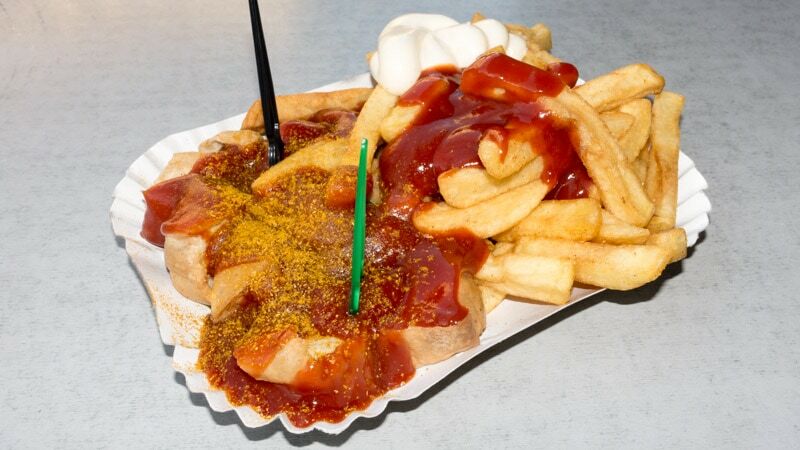 Currywurst is a popular and traditional German fast food found at food stands all across Berlin. The dish consists of steamed then fried pork sausage which is then cut into slices and covered with a curry ketchup and curry powder. The dish is usually served with a side of French fries. Everyone has their favorite currywurst spot in Berlin. In Kreuzberg, in the west, you have Curry 36. Konnopke’s Imbiss is the king of East Berlin. 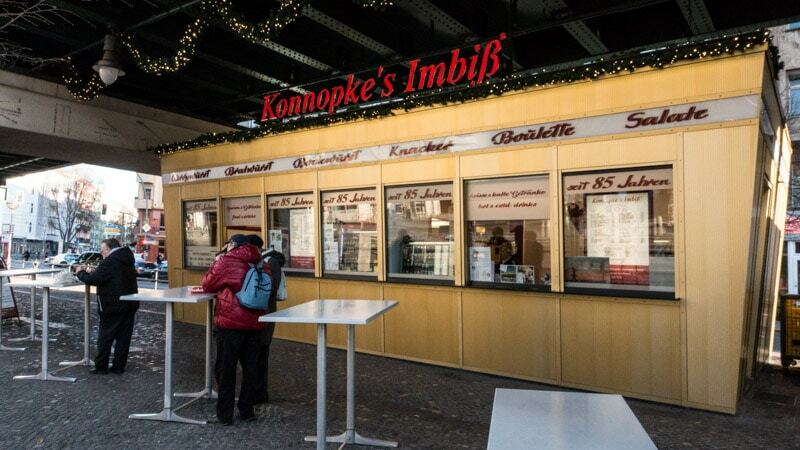 In my opinion, and according to many other Berliners, Konnopke’s Imbiss serves up the best currywurst in Berlin. Their sausages are juicy, spicy, flavorful, and cheap while the location makes you feel like you are eating at a local spot off the tourist trail. When you are ready to order, walk up to the window of the yellow metal panel food stand and place your order with one of the friendly German-speaking ladies. They might not know a lot of English, but if you talk slowly and point, they will know what you want to order. When your food is ready, you can join the locals and stand at one of the high-top tables or take a seat inside the small covered seating area. On the day I visited it was cold and windy. Thankfully, they covered seating area kept me slightly warmer. This is the Currywurst with French Fries (3,50 EUR). This is why you want to come to Konnopke’s Imbiss. This is why they are famous. When you order this simple yet classic dish you will be rewarded with a plump and succulent sausage that is sliced and smothered in a special spicy and sweet curry ketchup. Topping the juicy and savory sausages was a good dusting of curry powder which added an extra layer of flavor. What I loved most about the sausages was the crispy casings, which to me, really set the currywurst apart from other stands in the city. On the side was a healthy serving of golden yellow, crispy, and hot Pommes Frites covered with the same curry ketchup and a dollop of mayonnaise. Both the ketchup and mayonnaise were optional, but I recommend you order them both as Europeans do. Remember to make use of the small forks while you eat. If you don’t, your hands will be covered in a sticky and sweet ketchup. For such a simple dish, I was surprised how well the flavors and textures complemented each other. Smoky sausage, sweet and spicy curry ketchup, tangy mayonnaise, and crispy and hot French fries. It doesn’t get much better than that for the price. The women who worked the food stand were quite friendly but didn’t know too much English. The food came out hot and quick, but not so fast that it was premade or sitting around. After I made my order and picked up my food, there wasn’t any further interaction with the workers. To be honest, I could careless if Konnopke’s Imbiss has the best currywurst in Berlin. I just wanted a tasty, hot, and affordable sausage covered in a spicy and sweet curry ketchup along with a side of French fries. If you are in Berlin, make sure you stop by Konnopke’s Imbiss at least once.